Cooler Master has announced the availability of two new air coolers. The Hyper 212 RGB Black Edition and the Hyper 212 Black Edition are the latest additions to join the company’s legendary Hyper 212 series. 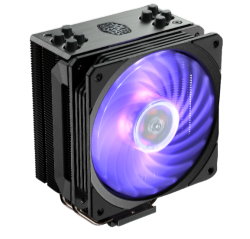 Originally designed and manufactured by Cooler Master in 2007, the Hyper 212 has evolved with the market over the past 11 years and has remained one of the most popular CPU air coolers available to consumers. The new Hyper 212 RGB Black Edition and Hyper 212 Black Edition both offer an improved installation process from previous models with the same best-in-class performance for an affordable price. 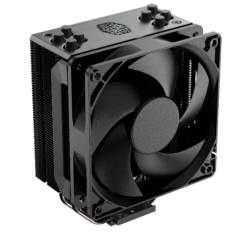 Designed with PC enthusiasts in mind, the new Hyper 212 Black Edition coolers keep with the familiar four heat pipe design of the original Hyper 212 and continues to offer direct contact technology for more thorough heat dissipation. The updated brushed aluminum top cover, nickel plated anodized fins and heat pipes, and metallic heat pipe caps give the Hyper 212 Black Edition models a premium, aesthetic appeal. The Hyper 212 RGB Black Edition comes equipped with the new SF120R RGB fan and RGB LED controller for lighting customization, while the Hyper 212 Black Edition offers users a more simplified look via the all-black Silencio fan with exclusive Silent Drive IC technology. Both the Hyper 212 RGB Black Edition and Hyper 212 Black Edition will be available for purchase in North America, November 5, 2018, for a starting MSRP of $39.99 USD (RGB Version) and $34.99 USD (non-RGB). Images © FrostyTech.com and may not be reproduced without express written permission. Current students and faculty of accredited Universities may use Frostytech images in research papers and thesis, provided each image is attributed.